Description: The Canada goose is very easy to identify with its long black neck, black head, and white cheek patches. Several different races of Canada goose have been recognized. The four smallest races, or subspecies, have now been categorized as a separate species, the cackling goose (Branta hutchinsii). The remaining seven races can be differentiated by small variations in the shape, size and proportion of the bill and head. Body weight ranges from 3-9 kg (7–20 lbs) and wingspan from 1.3-1.7 m (50-68 inches). 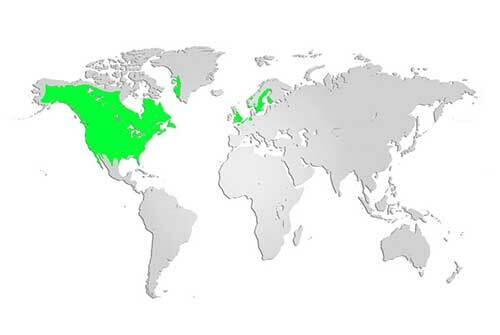 Distribution and Habitat: There are populations of Canada geese all across North America, from the treeless arctic tundra to the southern United States. Canada geese are well known residents of nearly all types of wetlands, as well as municipal park and beach areas. Overwintering occurs from areas of the central USA to southern Mexico and along the Gulf Coast. Characteristic V shaped flocks of migrating Canada geese are a very common sight and sound all across Canada every spring and fall. Flying as many as 1000 km (620 miles) per day, they can be found by the hundreds in fields and wetlands, resting and feeding during their semi-annual trip. Diet: Herbivorous, Canada geese eat a variety of plant species, particularly aquatic plants, grasses, sedges, grain, and berries. Life Cycle: Pairs of Canada geese mate for life, but if one is killed, the other will take a different partner. Returning to the same area, often the very same nest, year after year, mated pairs nest on land, near the water, and often prefer islands. The female goose sits on the eggs while the male stands guard nearby. Goslings (baby geese) hatch after an incubation period of 25-28 days. During the last few days inside the egg, they communicate with their parents via tiny peeps and trills. Early spring nesters, Canada Geese goslings will be hatched and ready to feed when the new vegetation is most nutritious. Goslings will remain with their parents for a year and usually start reproducing at 2-3 years of age. 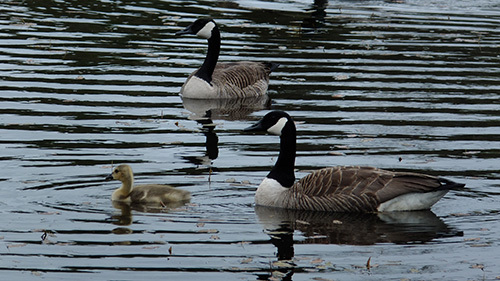 Canada geese are protective of their young and can be aggressive. Did you know? Their legs are set more forward on their body, making them better at walking on land than ducks and swans.